Making sure that you have the proper shape of eyebrow can be one of the easiest and cheapest ways to make yourself beautiful. Too often I see women who have either over plucked, misplaced their arch, or took too much off the front or the ends. At some point I actually think that having bushier eyebrows can be better than a misplaced arch. There are some very simple rules to follow to make sure that you have the correct shape. It's all about proportion. 1. Take a pencil and line it up with the side of your nose, not outside of the nostril, but on top of it right outside of the ball of your nose. This is where the brow should start. 2. Take that pencil from the same spot and rotate it while looking forward to the right of the pupil. This is where the arch should be. 3. Finally, rotate the pencil to the end of the eye. This is where the eyebrow should end. You can also see from the photo below that the eyebrow should line up horizontally. Another tip if you aren't sure how it will look, is to use concealer on your brows all the way around to block out the shape you want, then if you like it, pluck only the hairs covered in the concealer. It helps to see which hairs need to be plucked and prevents over plucking. 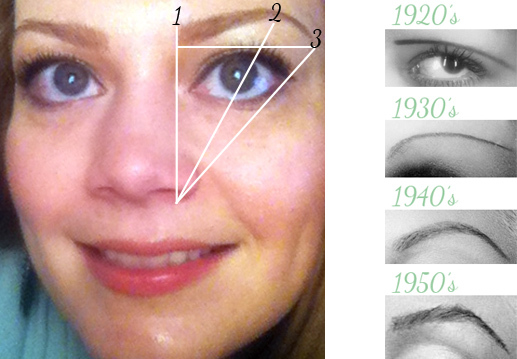 I've also included an example of how eyebrow shapes have changed throughout the years. Eyebrow proportions and eyebrow shapes throughout the years.